n Turkey, it is obvious that there has been a huge academic gap in Syrian studies and scholars dealing with Syrian politics and foreign policy generally do not go over the pre-Baath period. 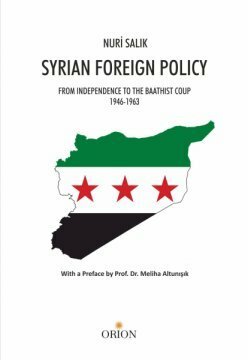 The main objective of this book is to analyze a neglected period of Syrian foreign policy during the so-called pre-Baath period from 1946 to 1963 in a historical perspective. In the book, it is argued foreign policy behavior of Syrian politicians regardless of their class, ideology and political orientations depended on historically rooted pragmatism in which interest calculations, shifting alliances and external patronage had special importance. In this respect, the book yields insights into the roots of Syrian foreign policy in the decades preceding the al-Assad dynasty. Syrian-Israeli Relations under Husni al-Zaim: Towards a Compromise? Syria and the Cold War after the Second Shishakli Coup: Rapprochement with the West?